One of our favorite places to eat while in Steamboat Springs, Colorado, is the Ore House at Pine Grove. It used to be a old barn that was converted into a restaurant. It's about 100 years old, as old as Steamboat Springs! The rustic decor with old stoves, photos, wagon wheels and memorabilia make you feel part of a Western tradition. 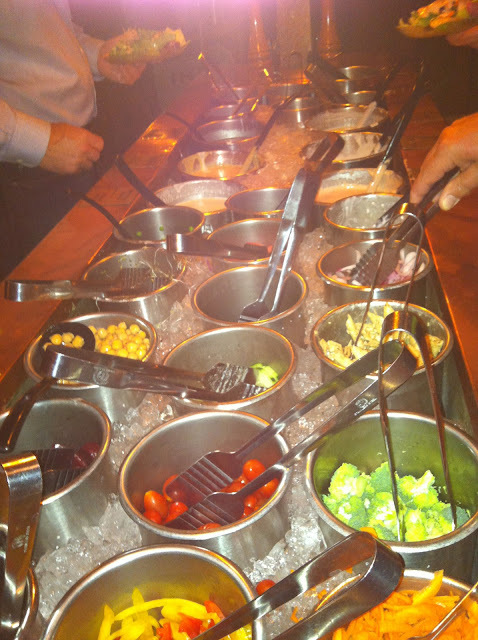 We love the Sunset menu, available from 5:30 to 6:30 pm, you get unlimited salad bar and an entree for $16.95! What a great meal deal after a day of hiking or skiing! Their salad bar is hands down is my favorite salad bar ever served on a crisp cold salad plate. The ranch and wasabi ranch dressings are to die for! My mother and I always order the Rocky Mountain Ruby Red Trout grilled with a baked potato with chive sour cream and green beans & asparagus! i love this! love the blog too! keep it up! Now I am so hungry!